For this braised veal breast, the meat is rubbed with garlic and rosemary, rolled up, and simmered in a vegetable-rich, white wine broth. The one thing I’m happy not to take back is our dinner at Marco Canora’s Hearth. It was a slam-dunk. (Holy cow, my first-ever sports metaphor.) When the hostess snaked us through the room and sat us at a four top, I was instantly plumped with self-importance. I was sure they knew who I was: David Leite, food writer. I expected the staff to bow and scrape in my exalted presence, but, instead, what to my wondering eyes did appear? A waiter who treated me (as well) as he did the other guests. No more, no less. My face began to set in that “Oh, no you din’t” expression—eyebrows arched, eyes half-lidded, mouth curled until bracketed by two deeply etched commas. “I’m sure they’re secretly thrilled,” said The One, “and don’t want to make a fuss over you in public.” I knew it was a lie, but it was just the emotional grease I needed to slide me into the evening without pouting. After perusing the menu, I told the waiter (henceforward named “Michael,” because when I was a waiter, it seemed any time a customer forgot my name, he called me Michael) that I wanted to order only dishes that are in Marco’s cookbook, Salt to Taste. “You pick for me,” I said. Off Michael went to confer with Marco. Superb. For a first course, The One ordered grilled calamari with smoked chickpeas and frisée, and for an entrée, roasted venison (which he was craving and why we picked Hearth), quince, autumn vegetables, and venison sausage. The quail was beautifully grilled, moist, and tender. The knife Michael slid into my place setting seemed almost a nod to tabletop protocol rather than to fulfill any real function. My fingers were tool enough for me. The meat had a slightly charred tang that didn’t overwhelm the quail. The One and I actually shared from each other’s plate (a habit of mine he absolutely hates—something to do with never having enough to eat when he was a kid). His squid, like my quail, was tender, and the chickpeas picked up the smokiness where the quail left off, but—again—not overpowering his plate. The One loved his medium-rare venison, but it was too gamey for me. No matter. I was content with my veal and gnocchi, and when The One asked to have a few, it was I who felt the need to wrap my arms around my plate and scream, “No, they’re mine! All mine!” But it was his birthday. I smiled and let him have his fill. Hey, I’m just that kind of guy. Click for Marco’s gnocchi recipe. There are several advantages to making the veal a day in advance. 1) Breaking the cooking into two parts makes for short easy work just before serving. 2) The veal can be sliced neatly only when chilled. 3) It is easier to defat the chilled braising liquid—just spoon the fat off before you reduce the liquid. In a pinch, you can forgo these advantages and start and finish the veal in the same day. But in that case, I would advise you to skip slicing it and serve it whole—a dramatic if slightly more rustic way to go. 2. Lay the meat flat on a clean work surface. Mix the minced garlic, chopped rosemary, and 2 tablespoons oil in a small bowl. Spread evenly over the meat, then season liberally with salt and pepper. 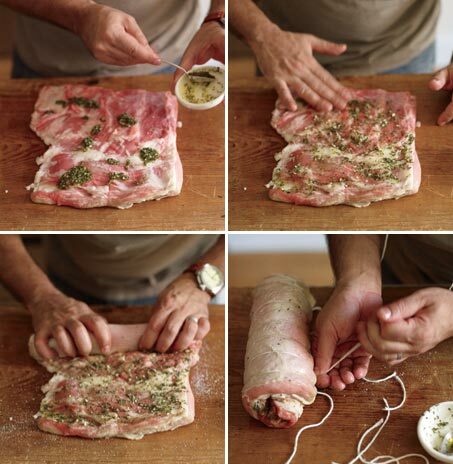 Roll the meat into a tight, thick roll, securing it every few inches with butcher’s string. Season the outside of the meat with salt and pepper. 3. Heat a deep pan just big enough to hold the meat over medium-high heat and add enough oil to generously coat the bottom, about 5 tablespoons. Add the veal and brown it on all sides, about 10 minutes. Remove the veal from the pan and reserve. 4. Add the carrot, onion, celery, and garlic head. Cook, stirring occasionally, until the vegetables brown and soften, about 5 minutes. Return the meat to the pan. Add the rosemary sprigs and wine. Let the wine boil and reduce until the pan is almost dry, then add enough broth to surround and just barely cover the meat. Bring to a boil on top of the stove, turn the veal over, and put the pan in the oven. 5. Braise the veal, turning it every 20 to 30 minutes, until it is tender and a knife can be easily inserted and removed (always check the thickest part closest to the center), about 2 hours. 6. Remove the pan from the oven and allow the veal to cool in the braising liquid. Take the meat out of the pan and put it into another container. Strain the braising liquid over the meat (discard the vegetables). Cover and refrigerate the veal in the braising liquid overnight. 7. To glaze the veal, preheat the oven to 375°F (190°C). Remove the meat from the pan and cut it into slices about 1/2 inch thick. Skim the fat from the braising liquid. Put the liquid into a saucepan and bring it to a boil over high heat. Skim frequently and reduce until the liquid is slightly viscous (the amount of time this takes will depend on your broth). 8. 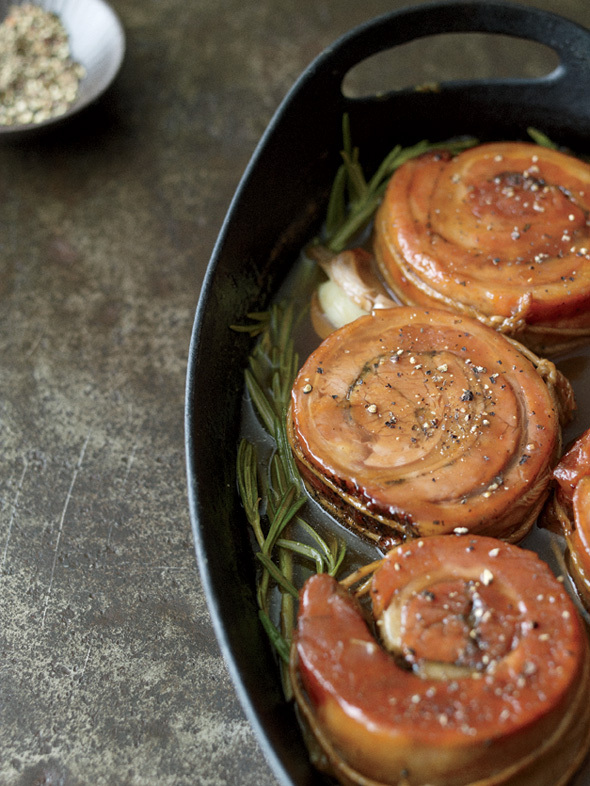 Arrange the veal slices in a roasting pan big enough to hold them in a snug single layer. Pour enough of the reduced braising sauce around the veal so it comes about two-thirds of the way up the meat. Crush the garlic with the flat of a knife and add it along with the rosemary. Baste the veal with sauce and place it in the oven. Glaze the veal, basting it with the sauce every 5 minutes, until it is browned and heated through, about 40 minutes. Serve. Braised Veal Breast Recipe © 2009 Marco Canora. Photo © 2009 John Kernick. All rights reserved. All recipes and photos used with permission of the publisher. Ohhhh when I read the part about your veal being delish enough to rub all over your body, I got to laughing so hard the tears were rolling! Fabulous review—thanks so much for sharing. Happy (belated) birthday! Love having the newsletter back and LOVE the idea of asking the chef for a meal out of his cookbook—so when are you opening up a restaurant? You have confirmed that I made the right decision in choosing Hearth for *my* b-day dinner next week. Thanks! But I’m amazed that you never had Marco’s gnocchi before! They are what every russet potato dreams of giving its life to become. We used to think the gnocchi at Arqua were ethereal—but Marco takes them to a whole other level. Suzanne, I did have the gnocchi early this year, but more often than not, my work keep me chained to the stove, so I don’t eat out. But, hey, who’s complaining? 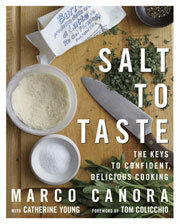 I really must get out to Hearth soon as well as pick up a copy of Salt to Taste. That veal sounds amazing. Thanks for sharing the recipe. My pleasure. I’m not sure if the veal is seasonal, so call before you go. Veal is one of my favorite meals to eat, but I find it being the hardest for me to prepare! My husband does a much better job.. but I am determined to get the hang of it. I think it’s because I don’t really have an end goal in mind.. just for it to taste excellent, not really a texture goal. I’m working on it. I love the pictures you have up!